With Remembrance Day nearly upon us, and marking 100 years since the end of the First World War, The Past Present is turning its attention to the amazing work done during the war. Of course, many millions of soldiers have served in war, and many lost their lives. Yet there were others who made brave contributions at the front, without ever entering into battle. The Salvation Army, was one of these groups. During the First World War the Salvation Army played a vital role, not just in keeping the home fires burning, but in supporting the morale of troops on the front line. The Salvation Army groups of many allied countries sent representatives to war ravaged countries, including France, where they set up canteens, rest facilities and hostels. Often these facilities were not far from the front line, and the Salvationists were themselves in great danger, but they served as friends, confidants and comforters to many troops despite the dangers. One of the most famous roles of the Salvation Army, particularly of the ladies who served in war torn countries, was serving doughnuts, as the image above shows. The first Salvation Army doughnut was, according to legend, served by Helen Purviance, a Salvation Army ensign from America. Cooking over a wood fired stove, and frying just seven doughnuts at a time, in the first day Purviance and her girls served 150 doughnuts to troops who patiently waited in line, standing in the mud and being pelted by rain. The next day they cooked double this number and later, when properly equipped, Salvation Army canteens would serve up to 9000 doughnuts a day to eager troops. This week, with the Sir John Monash Centre in Villers Bretonneux opening, and ANZAC Day commemorations fast approaching, The Past Present turns its attention to War Postcards. The image above is a shocking and stark snapshot of a battlefield where thousands of Australian soldiers served, and many lost their lives. Today, many might find such a postcard a strange subject, and one which is a little macabre. Yet this postcard, one of a set, is just one example of postcards highlighting the destruction and devastation of war. During the First World War, postcard publishers created many thousands of different cards reflecting the war. Some of them were humorous, others beautiful and patriotic. Some even had embroidered pockets or pictures, meant for ‘mum’ or ‘ my sweetheart’. Yet many of them were stark and devastating reminders of the war, showing photographs of battlefields, and even of corpses. These cards, which were sometimes sold in sets, like the postcard of Villers Bretonneux above, highlighted the destruction of war. As the war progressed, they heightened feeling against the then enemy with captions like ‘The work of German “Kultur”’, as in the postcard above. As the war raged on, battlefields and destruction became opportunities for propaganda postcard publishers, and more postcards were created. This week, in recognition of Remembrance Day, instead of focussing on an Australian location, The Past Present is sharing the shocking image above of a place which has played a significant role in Australian history – The Somme. Thousands of Australians fought and died defending French towns, and on the Somme battlefields. For many, a postcard, something which is usually seen as a tourist souvenir, is not something they expect to see showcasing such shocking imagery. Yet during and after the end of World War One, many postcards were produced depicting shocking scenes of wartime costs. Some showed ruined towns, like the image above, while others depicted punishment of the enemy, like the one below showing German prisoners being marched through the ruins of Villers Brettoneus. These ruins were partially the result of the first tank to tank battle to occur, resulting in massive destruction. Many wartime postcards, including those featured here, were produced by French publishers, who seemed to see the German policy of destroying any territory they had captured as a gift. Postcard producers and their photographers were not allowed near the active front lines, but after the conflict had moved on, they were left with shocking and highly emotive scenes of destruction. Their images stirred up patriotic sentiment amongst allied soldiers and those left behind on the homefronts alike. This week, with Remembrance Day having just passed us by, it seemed the perfect time to share the postcard above. 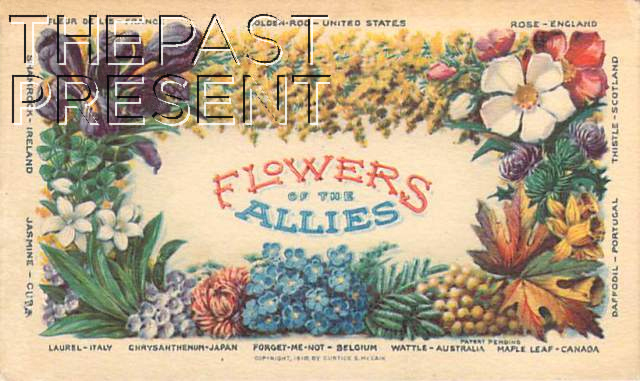 This is a fascinating card, bringing together ‘The Allies’ in a floral tribute. Of course, not all allies are represented (New Zealand is missing just for a start! ), but the card itself represents one of a vast number of patriotic postcards produced during the war. Postcards were ‘invented’ in the late 1860s in Austria, though at this time they were not illustrated. They were simply cards made to reduce the time and cost of letter writing. By the time of the First World War though, they had not only evolved to be what we recognise as postcards today, they were wildly popular. During the First World War, the sending of postcards reached it’s absolute peak, with thousands using the cards to send hasty messages to loved ones. Many were sent home from The Front, while those left at home had an endless choice of Patriotic Cards to send to their loved ones serving abroad. Of course, cards were not purchased just to be sent to loved ones, but also as additions to postcard collections, which were also very popular during this period. Postcards helped to commemorate events, with many postcards showing bombings on the home front, or the aftermath of a battle, and also to boost morale, with many beautifully illustrated patriotic cards, such as the one above, being produced. At home, they were available everywhere from chemists to cinemas, while on the Front, war cards were available in YMCA canteens, at rest huts and even in military training camps. This week, with ANZAC Day and the Centenary of the Gallipoli Campaign nearly upon us, it seemed appropriate to look at one of many cards in The Past Present collection relating to war and the ANZACs. There were many to choose from, but this image of ANZAC Parade in Sydney was chosen because so many people are familiar with the street, yet may not know it’s history. ANZAC Parade is a major road in South East Sydney which was originally known as Randwick Road. The road was an important part of the road network to Randwick and was also how people entered Moore Park in the 1860s, but it was then just a sandy track. Although always an important road, the stately and formal Parade we know today was built during the ‘Great War’ as it was then known, World War One. 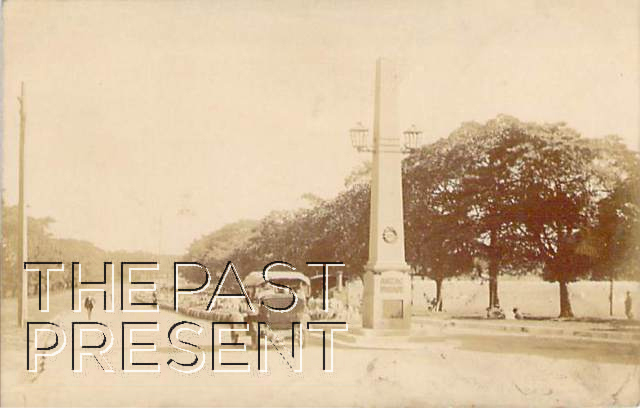 In fact, ANZAC Parade, and the ANZAC Obelisk which is pictured in the postcard above was one of the first memorials built to the ANZACs, being officially opened in March 1917, well over a year before peace was declared. Many may wonder why this road, seemingly no more important than any other, was chosen as the memorial. The route was very significant though, being the parade route which was taken by the 1st Australian Imperial Forces (AIF) when they left their camp at Kensington Racecouse to embark for overseas service. The road was constructed to feature a beautifully maintained flower bed in the centre strip, though this has long since been replaced by grass. The Obelisk, one of the earliest memorials to the Australian soldiers who left to serve overseas, predating both the ANZAC Memorial in Hyde Park and the Cenotaph in Martin Place, has sadly been moved from its original, prominent position. Once, the Obelisk marked the beginning of ANZAC Parade and was part of ANZAC commemorations, often pictured covered with flowers and wreaths, but it is now less prominent and partially obscured by fencing. It was moved 300 metres south in order to allow for construction of the exit portal from the Eastern Distributor onto ANZAC Parade itself. This week, with Remembrance Day nearly upon us, The Past Present is taking the opportunity to share the joyous scene in the image above. When peace was declared on the 11th of November, 1918, Sydney residents were jubilant and enormous public celebrations began to occur. The news came through early in the morning, but spread quickly and soon Sydney was a mass of excitement. Sirens associated with the harbour sounded in a cacophony rarely heard, trains blew their whistles, trams rang their bells and cars sounded their horns in a joyous (if probably rather dissonant) celebration of peace. The streets quickly filled with cheering crowds and soon enough patriotic bunting was hung and flags began to appear, being waved frantically from amid the excited throng. 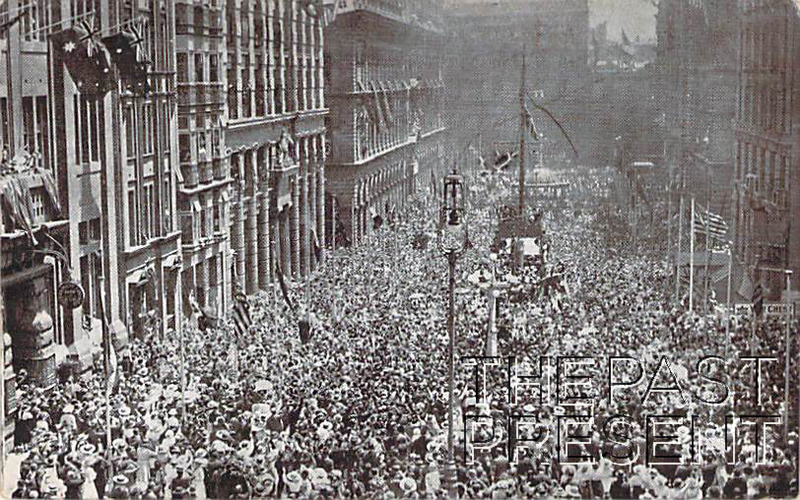 Moore Street was just one street which filled with people celebrating the long awaited peace and the photo above captures the excited throng which flocked to the celebrations. If you look closely though, you may notice that women outnumber the men taking part in the celebrations, reflecting the fact that many of Australia’s menfolk were still abroad, serving in foreign theatres of war, or had already lost their lives to the conflict. Last week, as many readers will be aware, the Lancers Parade was held in Parramatta to commemorate 125 years of the Royal New South Wales Lancers. What many do not know is about the important history of this military group in Australia’s and indeed world history. The Royal New South Wales Lancers were formed in 1885, though they were then known as the New South Wales Cavalry Reserves. They were renamed the New South Wales Lancers in 1894, but the ‘Royal’ in their title was not added until 1935. Today they are known as the 1st/15th Royal New South Wales Lancers. Since the late 1800s their barracks have been located in Parramatta and their nickname is the Parramatta Lancers. The Barracks themselves predate the formation of the Lancers and have a fascinating history in their own right. 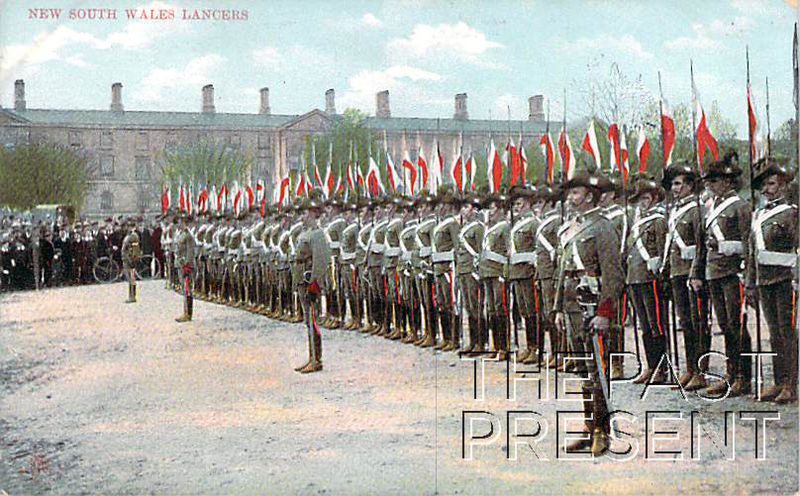 The Lancers have a distinguished history of active service, dating back to the Boer War. In 1899 a squadron of the Lancers who had been training in England were the first Colonial troops to actually arrive in South Africa. During the 1st World War, the Lancers were a militia unit and as a result they did not serve abroad, though they did receive a number of battle honours. However, many pre-war members of the Lancers did join up for service, joining the Australian Imperial Force. Many of them served in the famous Light Horse Regiments which fought in Gallipoli, Sinai and Palestine. In fact the Light Horse Regiments included a substantial number of Lancer trained men. Subsequently the Royal New South Wales Lancers were actually designated the successors of the 1st Light Horse Regiment and later still, in 1956, the 1st was linked with the 15th, making them also the successors of the 15th Light Horse Regiment. During the 2nd World War the Lancers were incorporated into the 2nd AIF as an armoured regiment and served in New Guinea and Borneo. In fact, the regiment made the heaviest Australian tank attack of the war. Since the 2nd World War, the Lancers have continued to serve, with full time units seeing service in Bougainville, Malaysia, East Timor and the Solomon Islands. They currently hold 21 military honours, making them one of the most decorated units in the Australian Army.